4/1/13 - 5/1/13 | sweet juniper! 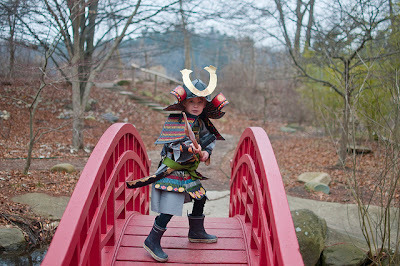 "Yes, ninjas are definitely tough and cool. But they have no honor." 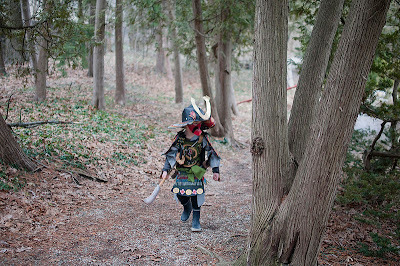 "Ninjas sneak around in the shadows and throw crushed glass in your eyes when you find them. Where's the honor in that? 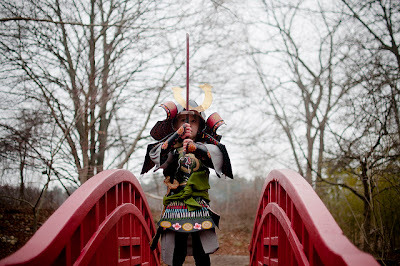 A samurai has honor. A samurai would never throw crushed glass in your eyes. Dude, have I never told you about samurai?" That's all it really takes for a new obsession to start at our house, fueled in this case by knowledge ill-gained from classic samurai movies and reading The Tale of the Heike once in 2004, with all its feuding clans of samurai and warrior monks and raging fires, earthquakes, battles, suicides and executions. I knew reading that book would all come in handy someday, I thought, clenching my fist with this minor victory of fatherhood while explaining the concepts of seppuku and bushido to a fascinated five-year-old boy. I mean, when one of the core tenets of your existence is that KNIGHTS ARE AWESOME, what do you even do with the knowledge of how much more awesome a samurai is compared to a bunch of sweaty guys from France stumbling around in tin underwear? I mean, even after they knew guns existed, the samurai were like, "Nah, man: swords are better." For like centuries! So I'm explaining feudalism and Japanese isolationism and holding a globe while talking about the geography of northeast Asia and it's starting to get a little too homeschooly up in here so I tell him that the only thing the samurai ever did was train to fight and then go out and fight: "In battle the samurai showed no fear and actively sought death. During peace time they would grow restless and get in fights for no reason. They would overreact and imagine slights from common people and the law gave them the right to cut down anyone, man, woman, or child who disrespected them. They also had to do anything their masters told him without questions. If their master was killed they had to go kill the guy who did it and bring back his head and throw it on their master's grave and then probably commit hara-kiri on the grave too and man there must have just been piles of dead samurai everywhere in medieval Japan." I should probably go ahead and hire a scholar of Japanese history to instruct my son on the dull realities of the Tokugawa Period so he doesn't rely solely the word of a man whose knowledge arrived via far too many B&W samurai movies. Aside from his honor, the coolest part about a samurai was probably his armor. 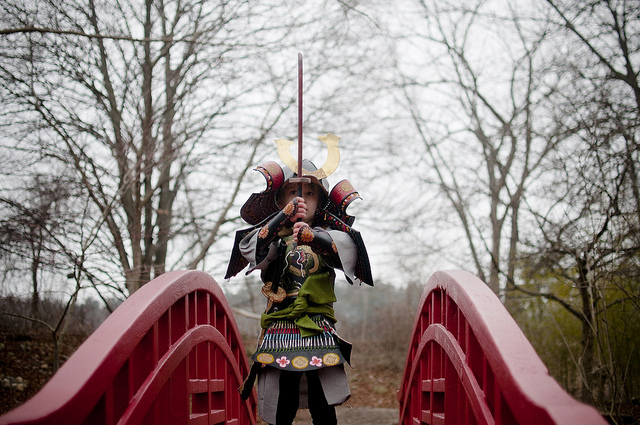 Samurai armor so bizarre and terrifying yet also colorful and beautiful. 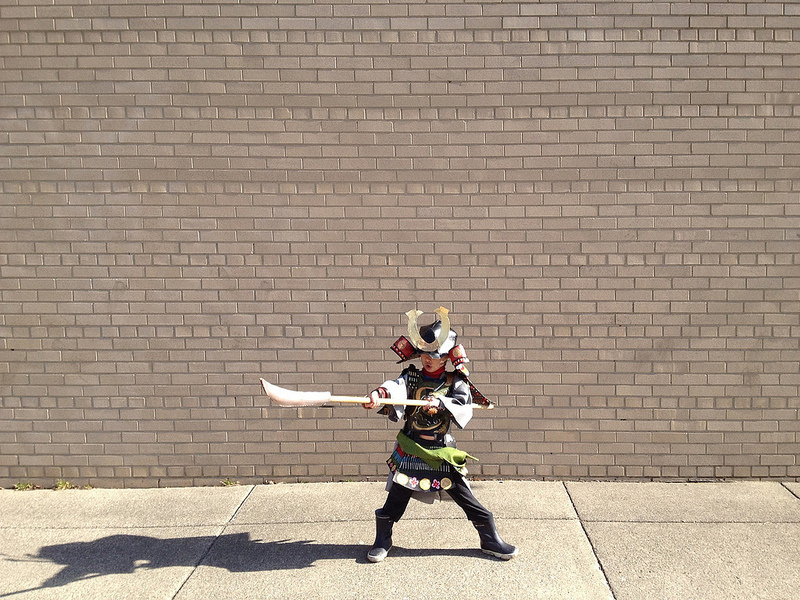 The University of Michigan Museum of Art had a full suit of Edo-era armor that I used to stare at all the time when I was in school, and I drove the kids over to Ann Arbor to see it a few weeks ago (unfortunately it wasn't on display). 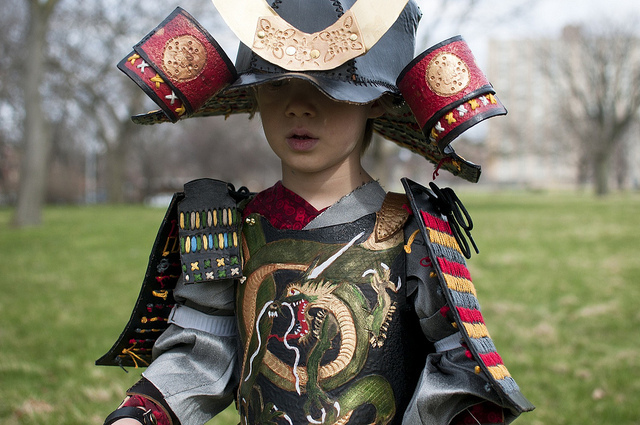 My son and I have spent a lot of time looking at pictures of samurai online so I wasn't surprised at all when all he wanted for his birthday was "samurai armor" and damn, I was excited to make it. I still have my boy with me all day Mondays and Fridays and those are the days we make stuff and then go out and have adventures. He is so much fun right now. 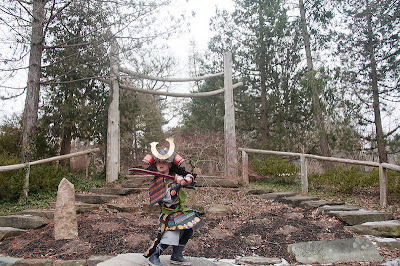 For this armor I started with those huge rectangular shoulder pads (sode), punching tons of holes in the leather and using embroidery floss for the traditional silk cords that make traditional samurai armor so colorful. In retrospect I wish I had used something thicker, like shoelaces or even nylon parachute cord. Then I made the cuirass (do), also out of good 8-9 oz leather. I found some old woodblock paintings of Japanese dragons and incorporated some of my favorites into a single design that I drew and carved into the leather. The dragon also loops around onto the back of the armor. 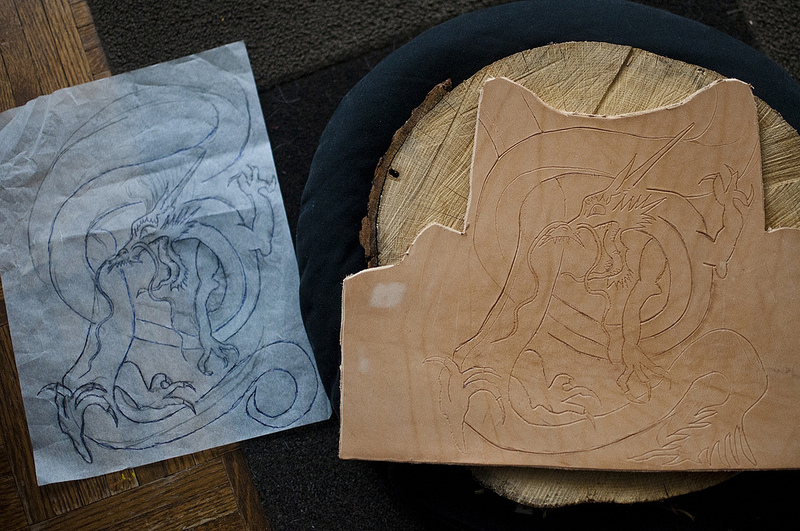 After carefully carving the design I nervously added the dye, mixing green and gold leather dyes for the dragon's skin. I was so inspired by all the real armor we looked at that I really wanted to make this as beautiful as I could. After adding buckles and straps I got to work on the helmet. 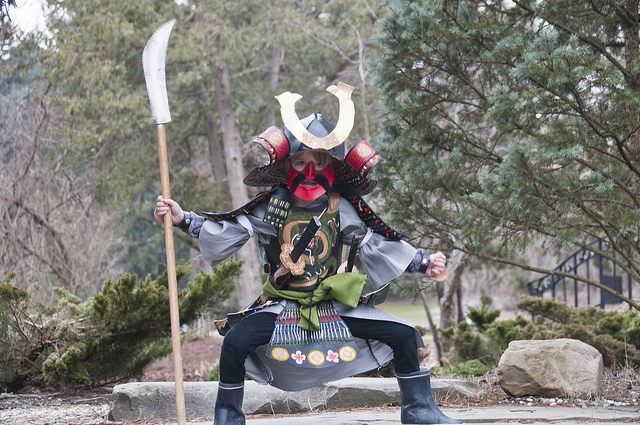 It was so much fun seeing that helmet (kabuto) take shape. The back is made from overlaying strips of leather tied together with the embroidery floss. 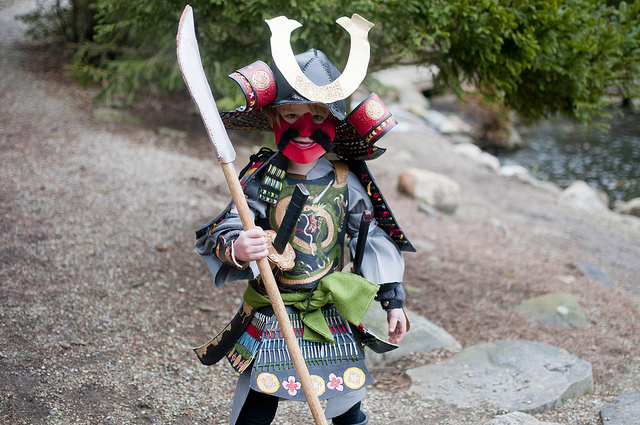 Of course no samurai helmet would be complete without the metal crest signifying what clan the samurai belonged to. We chose the fairly common one that resembles the leaves of the sagittaria plant (don't worry: I filed the edges dull). Next we worked on a mask (hoate). A lot of the old masks had big bushy mustaches so I couldn't resist. He really loves looking at himself in these pictures. Whenever I show him these pictures, he stands behind me imitating all the moves he's doing in each shot. It's pretty awesome. All the designs on the arm and lower torso protective plates we found in the gorgeous Utagawa Kuniyoshi samurai woodcuts that we looked at for inspiration. 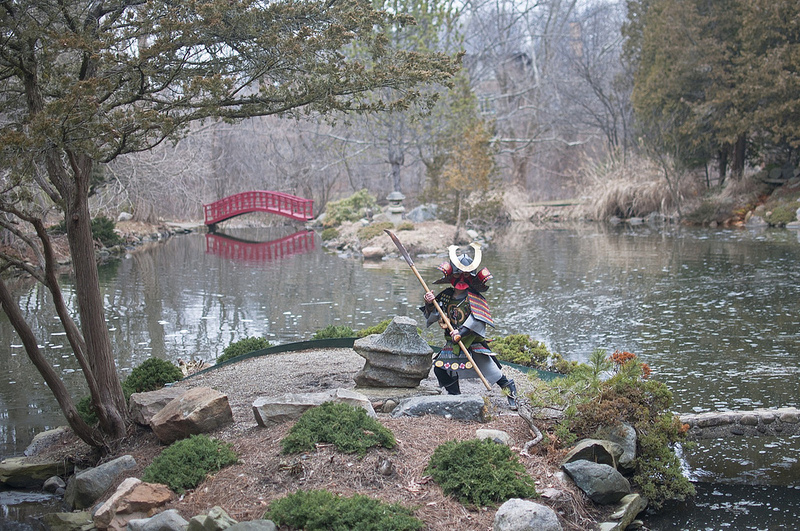 One day we went to the Oriental garden on the grounds of the Cranbrook Educational Community and went on a hunt for enemy ninjas and nasty sea serpents. 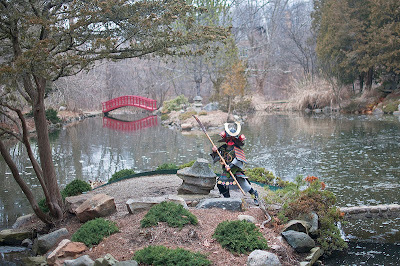 In most of these pictures he's holding his leather naginata spear. I've been making the kids wooden ninja swords for months so we have a bunch of them. 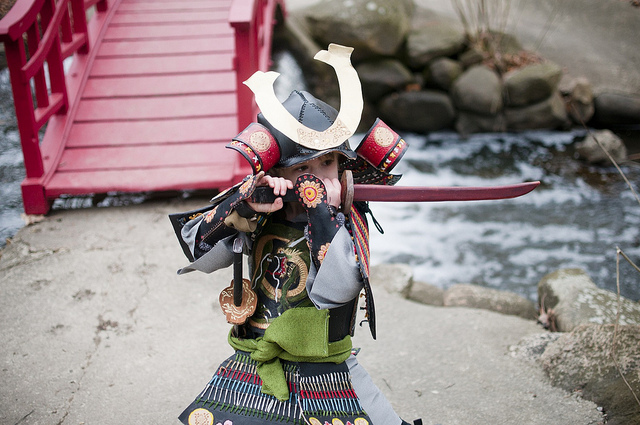 I told him all about how the Japanese perfected the art of sword making and read him passages from books about all the labor and the many craftsmen it took to craft a single blade. 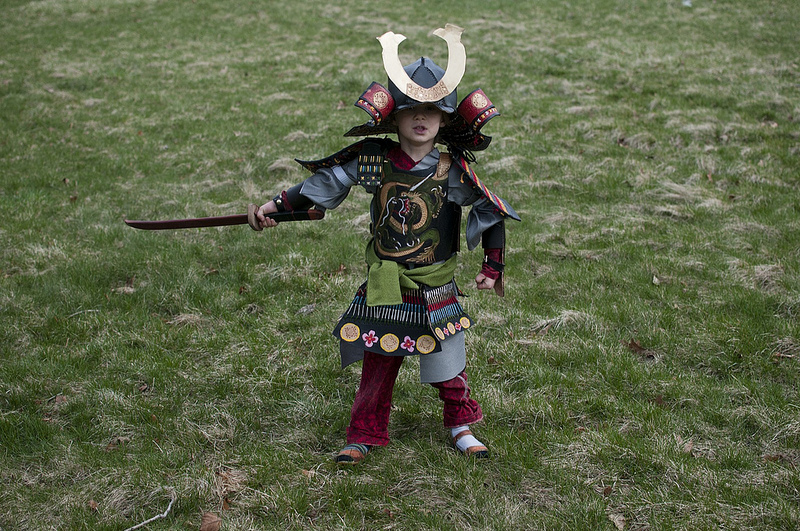 In one of the books we read it said that most samurai boys were given their first set of armor and swords at age five. 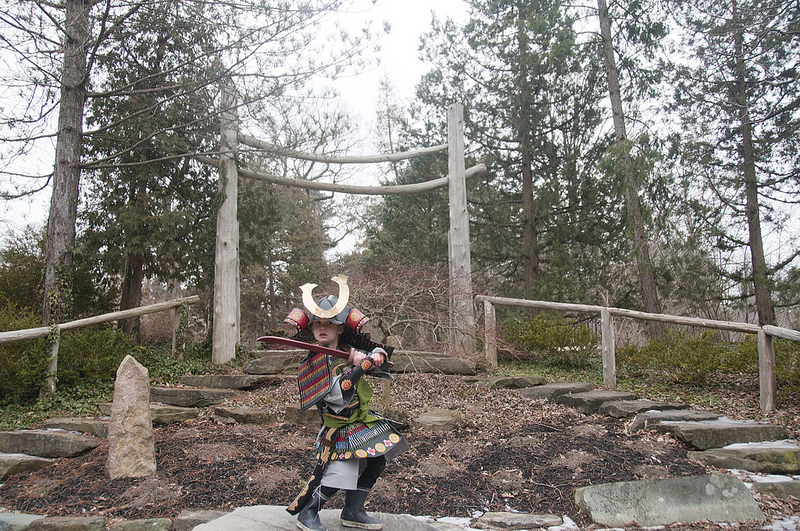 I made him a special sword for these adventures out of a beautiful wood called katalox. 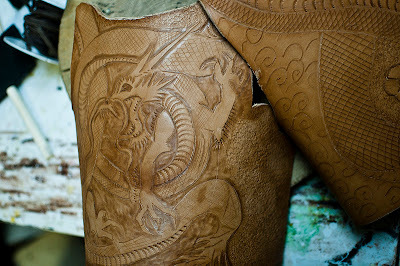 Like any good samurai, he gave his sword a name ("golden dragon"), so I carved a dragon on the sheath and dyed it gold. 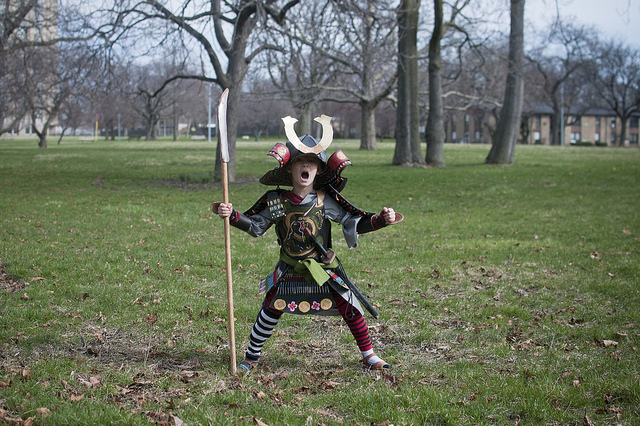 We like to go to the park and have fake samurai battles where we run toward each other like they do in the movies and then with a single slash one of us falls down and dies dramatically. I taught him all four Japanese words I know: hai, iie, ikimashou, tachishoben (yes, no, let's go, public urination). 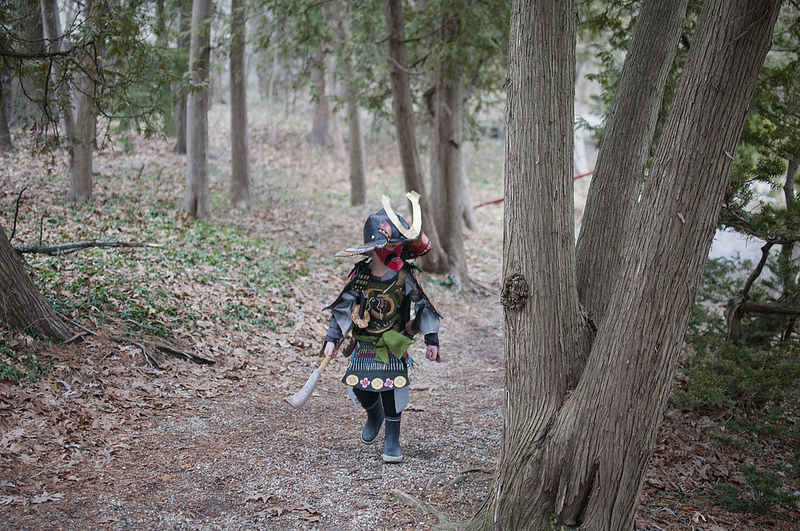 He yells them at me randomly while running toward me with his katana. I almost didn't share this project because we're venturing into some fairly extreme nerd territory here, but in the end I don't care. We're also having a lot of fun.